Topaz is derived from the Sanskrit word "tapas," meaning fire or Greek word "topazos" meaning "green gemstone" . Topaz is a silicate mineral of aluminum and fluorine. Topaz has been known for at least 2000 years and is one of the gemstones which form the foundations of the twelve gates of the Holy City of the New Jerusalem. and the state gemstone for the US state of Utah. Orange Topaz is Utah's state gemstone. Pure topaz is colorless and transparent but is usually tinted by impurities. During Middle Ages topaz was thought to strengthen mind and prevent mental disorders as well as sudden death, it was also considered a "cooling" gem. it also has the ability to quickly cool boiling water and flaring tempers. 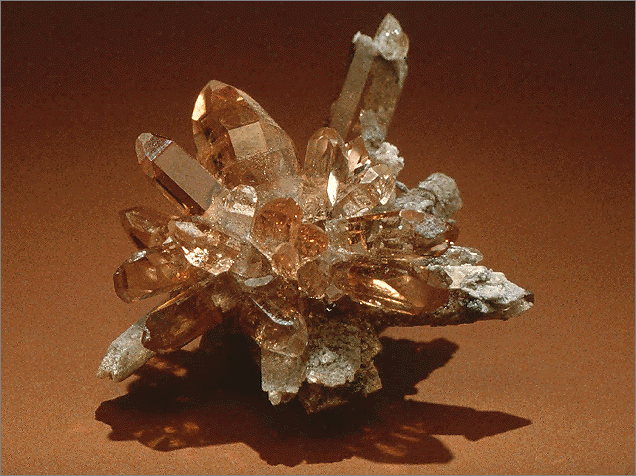 As medication, topaz was used to cure fever.